Stormwater Best Management Practices (BMPs) are techniques that will best manage stormwater quantity and quality on a site, based on unique site conditions, and planning and engineering requirements. BMPs involves site development design that incorporates the most suitable techniques, or combination of techniques to best manage the anticipated stormwater flow and quality based on an evaluation of site conditions and planning requirements. While a combination or system of BMPs should be included in site designs for the most effective stormwater management, it is preferable that the overall site design be based upon the protection of existing natural resources and hydrological features, with these features incorporated into the overall site design with little or no disruption. Traditional BMPs are effective in temporarily detaining flood waters, by releasing runoff over an extended period of time to adjacent properties and streams, and have provided some level of water quality treatment. However, while they reduce the flood peak, they may increase the duration of elevated water surfaces as the detained water is released over time. Additionally, the stormwater carries increased pollutant loads, particularly in the immediate aftermath of a storm event, that require additional water quality treatment to protect stream water quality and aquatic habitats. 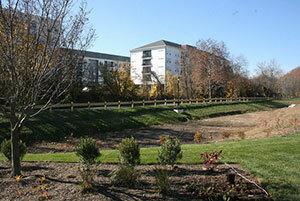 Advances in stormwater management have led to a natural hydrology site design process. This process first incorporates the existing natural resources and hydrological features into the overall site design with little or no disruption to these features, and then incorporates low-impact BMPs around them, and only then proceeds to incorporate standard BMPs if they are still required. This approach minimizes disturbance of land area, natural features and site hydrology, preserves concentrations of open space, woodlands and environmentally sensitive features, and incorporates landscape-based BMPs low impact development techniques to minimize the usage of traditional structural stormwater facilities. Stormwater BMPs are applicable for every landscape. Urban landscapes, such as boroughs, frequently experience severe stormwater runoff impacts due to the density of development and high percentage of impervious surfaces that produce increased runoff. BMPs should be incorporated into new developments in urbanized areas, and these areas should also be evaluated for retrofits to correct existing stormwater runoff problems. Rural landscapes may also consider agricultural BMPs (often referred to as conservation practices) which are frequently defined in soil and water conservation plans developed for individual farms. Guidance and oversight of these plans and practices are provided to farmers by the Chester County Conservation District (CCCD), Natural Resources Conservation Service (NRCS), and cooperative extension agencies. CCCD also reviews and implements the erosion and sediment control program for construction sites (under the National Pollutant Discharge Elimination System, or NPDES) for Chester County. Chester County municipalities must implement stormwater management by adopting the approved Countywide Act 167 Ordinance, or equivalent standards, as a separate stand-alone stormwater management ordinance. Additionally, technical evaluation and design guidance documents may be recommended or provided to assist designers in understanding state-of-the-art options and their performance, design, maintenance, and cost aspects. Within the ordinance or accompanying guidance documents, a hierarchy of types of BMPs can be established to encourage the use of those practices that best suit the conditions and needs of the municipality. For example, BMPs that reduce the volume of runoff and enhance groundwater recharge of stormwater may be defined as highest priority (given suitable site conditions) while traditional detention ponds maybe defined as lower priority. The list of accepted BMP practices continues to expand as new practices are proven effective. Protects Natural Resources: Protection of natural resources, along with the aquatic habitats and species within them. Permanent Protection is Required: BMPs require permanent protection from alteration to ensure long-term operation as designed. Hierarchy of Practices: The most effective municipal process for implementing BMPs is to include a site design process in its municipal code with a hierarchy of stormwater management practices. The hierarchy should indicate that an applicant prove that site conditions are not suitable to accommodate infiltration facilities before the use of traditional detention basins can be considered. A Model Site Design Process is outlined in Section 304 and Appendix B of the Countywide Act 167 Stormwater Management Model Ordinance. Current Technical Standards: The stormwater management ordinance should reference the most current BMP specification manuals or the municipality must include all necessary specifications within an appendix or directly in its municipal Code. The use of an appendix is encouraged to ensure that the specifications remain current without the need to continuously update a municipal code. Review of Stormwater Management Plan: The municipality should include a requirement for a stormwater management plan to be submitted with the preliminary plan, thereby ensuring that comprehensive stormwater management can be integrated effectively into the site design process. Model Stormwater Management Plan standards are provided in Section 402 of the Countywide Act 167 Stormwater Management Model Ordinance. This plan should be reviewed by the municipal engineer to establish that the most effective facilities with the least environmental impact were proposed, to the greatest extent possible, before detention facilities were considered. Inspection and Enforcement: Inspection and enforcement procedures should be established to ensure proper installation of the stormwater management systems, and to ensure the systems are properly maintained and operated. Model Enforcement provisions are provided in Article IX of the Countywide Act 167 Stormwater Management Model Ordinance. Educating Municipal Officials, Planners and Reviewers: An increasing body of literature and easily accessible educational opportunities is available for gaining more understanding of how BMPs can facilitate stormwater control within municipalities. These practices are also significant cornerstones in the protection and management of all water resources for multiple purposes (resource preservation, water supply, flood control, etc.) and they can be integrated with other ordinances for a comprehensive water and natural resources management approach. Design Requirements: The design and selection of stormwater management BMPs are dependent upon the designer/planner's technical understanding and expertise in the merits and limitations, performance standards, costs, management requirements, site conditions, and other design and evaluation elements of BMPs. This involves maintaining an up-to-date understanding of the most current technical information and specifications of advances in stormwater management. Therefore, a municipality should acquire, and also require, the use of the most up-to-date manuals and documents, several of which are listed at the end of this document. Municipalities are encouraged to contact the Chester County Conservation District or the Chester County Water Resources Authority for suggested references and educational materials. Ownership, Operation, Maintenance and Inspection Responsibilities: BMPs require, to varying degrees, routine maintenance to ensure proper operation. Preliminary plans should define specifically who will be ultimately responsible for the ownership, operation and maintenance of any system for its life span. The responsible party must have the financial ability and commitment to fulfill that responsibility throughout the life-cycle of the facility. The increased number of these facilities will also require increased inspection during construction and during the life-cycle to enforce proper maintenance standards and specifications. In addition, the pollutants removed from the filters of water quality BMPs must be disposed of properly, which can lead to a further burden on the municipality for enforcement, inspection and, in some cases, removal and disposal of potentially toxic/hazardous materials. Watersheds, An Integrated Water Resources Plan for Chester County and Its Watersheds, was adopted in 2002 as the water resources component of Landscapes. The County-wide Act 167 Stormwater Management Plan, which will be adopted in 2012, is comprised of the Watersheds Plan with an Act 167 Addendum. The Addendum will include a Model Ordinance and Standards Matrix for stormwater management related to land disturbance, Christina Basin MS4 TMDL Implementation Strategy, Act 167 Plan consistency requirements for state financed projects, and additional documentation required to fulfill the Act 167 plan requirements. Article V, Section 503(3) of the Municipalities Planning Code allows municipalities to include standards in the subdivision and land development ordinance governing how improvements will be installed as a condition of final plan approval. In addition, Section 503(5) allows municipalities to enact provisions for the regulation of subdivisions and land developments including provisions for "practices which are in accordance with modern and evolving principles of site planning and development." The state's Stormwater Management Act (PA Act 167) mandates that counties prepare and adopt a stormwater management plan for each of the watersheds within their county. The municipalities within each watershed are then required to adopt and enforce the provisions and stormwater control standards of the PA DEP approved plan. PA Act 167 plans have been approved for five of Chester County's twenty-one watersheds, including portions of sixteen of the 73 municipalities within Chester County. The remainder of Chester County and its municipalities will be covered by the Chester County countywide PA Act 167 Plan that is currently underway, and will be completed in 2012.